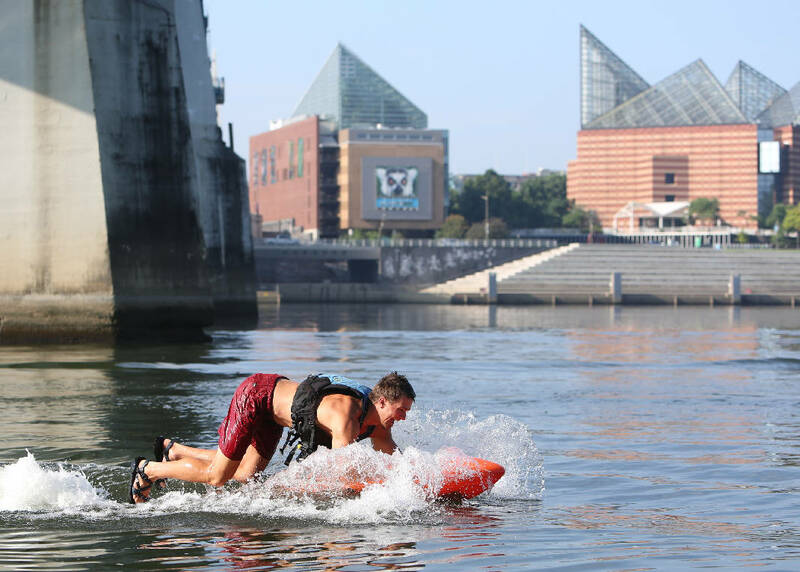 Cole Henderson, an adventure guide with Adventure Sports Innovation, shows off a Kymera electric jet body board in the Tennessee River under the Market Street Bridge Thursday, July 5, 2018 in Chattanooga, Tennessee. The board is one of Adventure Sports Innovation's products that they have for customers to use at their North Shore location. A new North Shore business is bringing an assortment of high-tech outdoor adventure equipment rentals and virtual reality experiences to Chattanooga. Adventure Sports Innovation held a soft opening and ribbon cutting ceremony Thursday morning to launch its water-based equipment rentals. Employees will work throughout the next week to launch the virtual reality components and finalize the River Street store for a grand opening ceremony July 14. "We're looking to make this a showcase for adventurers," co-owner Patrick Molloy said. "This is our starting point. We want to expand and grow this business. We'll see what the reaction is from both our local and regional customers as well as tourists who may come to the area." Carolina Molloy, the co-owner and wife of Patrick Molloy, believes the business is the first-of-its-kind in North America. There's nowhere else in the continent where customers can rent and buy the equipment they have, she said. The store has a human-powered water bike with a propeller, an electric off-road vehicle with independent motors for each tire, electric surfboards, hover boards, electric unicycles and more. Virtual reality experiences include hang gliding, a walk along a cliff and a walk atop a skyscraper. Another virtual reality experience allows users to design their own rollercoaster and ride it. The couple poured approximately $500,000 of their own money into the launch of the store, most of which went toward the equipment. For the couple, the business was a natural fit for Chattanooga. "This will marry two things the city already has: the Gig City technology and the Scenic City outdoor adventures," Carolina Molloy said. Carolina and Patrick Molloy moved to Chattanooga from New York last year. They both had corporate careers but wished to open their own business. Patrick Molloy had a passion for outdoor adventure sports and began looking for a destination that matched their needs. Chattanooga had the moderate climate they were looking for and reputation as an outdoor destination. "Chattanooga checked every box we had about what an ideal community looked like for us," Patrick Molloy said. "It had the support for startup businesses, a great outdoor community already, it was well-known for adventure sports and had beautiful scenery." Local chamber of commerce representatives attended the ribbon cutting event to welcome the new business to the community. "This is a one-of-a-kind opportunity, not only for Chattanoogans but also for our tourists to come in and enjoy Chattanooga like they've never seen," North Chattanooga Chamber Council President Ginny Kincer said.